We visited historic Belmont Manor, in Elkridge, MD, in search of ghosts, as part of Howard County Parks & Rec programs one evening in March. This wasn't a ghost tour, where you're led around and told ghost stories. This was a ghost hunt. We were excited about the opportunity to see this lovely historic manor, as well as to perhaps experience some other worldly contact. According to Margaret Ehrlich, founder of Inspired Ghost Trackers, the group leading the ghost hunt that evening, all the ghosts -- and there are several -- are "friendly" ghosts, although one of them was a "grumpy man," who was identified as an Andrew Lyons, who had suffered a heart attack while staying at the manor house. The manor dates back to colonial days, and started with a love story, so its current use is very apropos. In 1732, Caleb Dorsey, then of Annapolis, owned the land. Caleb Dorsey owned and ran several iron forges on the creeks that fed into the Patapsco River near Elkridge Landing, which back then, before erosion filled the river with silt, was a bustling and prosperous port (now most of the river is just a few feet deep, easily waded -- hard to imagine ships of any size navigating up it). His son, also Caleb, was an avid foxhunter, and while tracking a grey fox, found himself near the home of Priscilla Hill. They struck up a friendship that led to a romance and marriage. Father Dorsey gave his son the land, and Caleb the son built the manor house, where he and Priscilla lived, raising a family of three sons and six daughters. Caleb died in 1772, leaving the manor house to his son, Edward. It remained in the family for 200 years, passing through generations of Dorseys, Hansons, and Bruce families. According to a Baltimore Sun news article (April 13 2015; http://www.baltimoresun.com/news/maryland/howard/elkridge/ph-ho-cf-belmont-0416-20150413-story.html) Belmont Manor eventually was donated to the Smithsonian Institution, which used the estate as a conference center from the mid-1960s until 1983, when it was sold to the American Chemical Society. Howard Community College bought the property in 2004, and held hospitality classes there until late 2010. Eventually, Howard County obtained the property, and determined to renovate it as a wedding venue. There were about 25 of us on the ghost hunt, so not an intimate group, but they divided us into groups of eight and sent us to different parts of the manor. The night was cold enough to be kind of snowy and rainy, so we didn't get to wander over to the cemetery plot. Our group went first to the bridal suite, where we encountered Amanda or Amelia, a playful little girl who'd died of flu or pneumonia. We communicated with her via a cat toy that lights up when moved. Our group's leader placed it on the bed and invited her to play with it. After a few minutes, it lit up. They asked her some questions, such as how old she was -- six years old -- and whether her name was Amanda or Amelia (neither confirmed as a solid yes, although it seemed to indicate her name was Amanda). After a few minutes, we moved to another room, and we didn't get much activity, until eventually we came to the room where the grumpy man died. There the medium began channeling the grumpy man, who indicated his name is Andrew Lyons, a merchant possibly selling lumber. IGT takes the information provided through the mediums and researches it, with the goal of either verifying or debunking the information. A quick google search indicated there was someone, from Baltimore, named Andrew Lyons, but it didn't quite fit the period he was believed to have lived in. So how did IGT become aware of the ghosts at Belmont? Ehrlich said she'd been researching local places, and came across some stories about Belmont. She contacted the right people, and when Belmont re-opened, they contacted Ehrlich about holding some programs and lectures there, which the group readily agreed to. "We have loved every minute of it and look forward to many more to come," Ehrlich said. Ehrlich and IGT host these ghost hunts because this allows them some access to this haunted location. But she has other motivations as well. "We love what we do by helping others learn about the paranormal and ghosts," Ehrlich said. "We also love doing the investigations. It is like getting the best of both worlds. What we do is for free. Belmont makes the money and we like the fact that we can help them do this, while we teach people about what we know." If you get a chance to go on a Belmont Manor ghost hunt, do. It's fun, and you get to explore a cool, historic manor, which for me, is a bonus! Read the entire interview, which reveals some of the best haunted places in Maryland, here. Hours: Check the websites for dates and times when Belmont Manor is open or when ghost hunts are being conducted. Photo courtesy Howard County Parks and Rec. 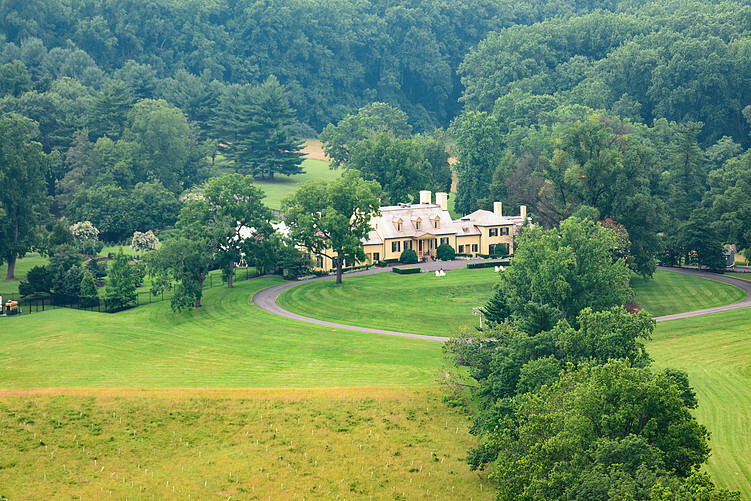 Six Historic House Museums You Should Visit!